Do you have a very talented child or children? This will be a great way to start your child’s writing and even keep them interested in writing their own books. They’ll be come entertaining to other’s and even have a little keepsake for them to remember their writings by when they grow up. They simply write their own story and draw out their own illustrations. That is why it’s called the “Illustory Junior”. 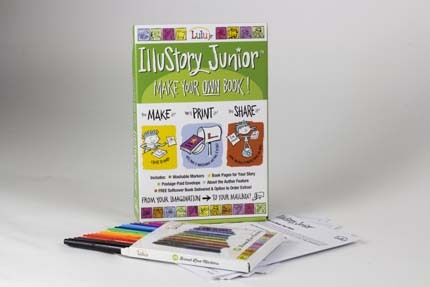 Lulu created this for children to publish their own books, just as other writers have for years. They can do it as a single child or as a team of children. 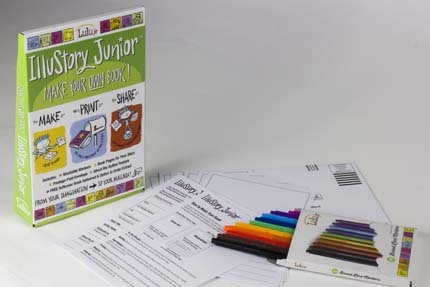 What I like the most about this little set for children to become published with their own stories is that it comes with washable markers, the pages for your story and then you have the ability to send it back to them in a postage paid envelope that is included in the box. On the back of the book, you’ll find the Author Feature / About Me. Then when everything is completed, within the 4 – 6 weeks, they’ll get their own FREE soft covered book delivered to their door. They’ll even have the option to order extras. With the extras, they could actually sell them to raise funds for collage! Every little bit and it will get them interested in writing for their future. The order form is inside the package along with instructions for the children to do this step by step. Lulu Jr. has actually taken the packaging to the next step! They didn’t harm any trees when they created this. It’s all recycled materials. This whole idea began with a New York’s Best Selling Author & Illustrator, Peter H. Reynolds. It is assembled in the USA. An awesome thing that you can do with this is to have it for a Birthday Party activity. The children will enjoy this and have a blast. They can become creative and even make their own stories on each page. A one page story for each child and have a book with many different stories. That would be one great keepsake for the Birthday child and their friends. They’ll remember it for years to come. It’s very unique and even a way for children to show their artistic side. They can show how talented they are and even show team work with creating stories and illustrations. It’s a great way for smaller children to learn and show the “before, now and after” effect. I received this product for my honest thoughts and a review. No other compensation has been given, nor is there any intended. All thoughts are my own and no other’s. This post is in compliance with the FTC guidelines.